Details about Hamilton Beach 76800 Open Ease Automatic Jar Opener NEW!! Hamilton Beach 76800 Open Ease Automatic Jar Opener NEW!! 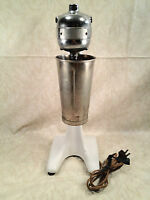 Antique Hamilton Beach Milkshake Mixer, Model 10, Stainless Cup 1925 Runs! Works really. Helps my arthritic hands.